Before starting any of the therapeutic methods that I am going to mention, the physical therapist should always first prepare the body, and align the joints and muscles to profit the most of the therapeutic methods and exercises. The physical therapist should begin with a massage and accessory and physiological passive mobilization exercises to improve and maintain joint mobility, and diminish the muscle spasticity. Passive, static, and gentle stretches are also performed to decrease and prevent muscle contractures. The physical therapist shouldn’t also forget to include in their treatments exercises to improve the ability to transfer (e.g. bed to wheelchair). 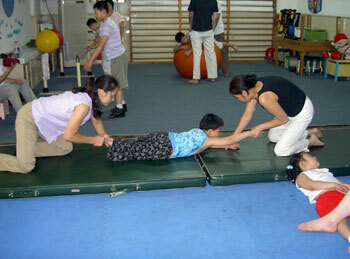 Several measurement tests can be used by the physical therapist to assess and evaluate the initial degree of disabilities of the child with CP, and to evaluate future improvements, such as the Gross Motor Function Measure (GMFM), the Gross Motor Performance Measure (GMPM), the Quality of Upper Extremity Skills Test (QUEST), the Peabody Developmental Motor Scales Fine Motor (PDMS-FM), the Bruininks-Oseretsky Test of Motor Proficiency, the Modified Ashworth Scale, and the Pediatric Evaluation of Disability Inventory (PEDI).